Is the US Navy, or NATO Maritime Command, watching the same ships I am? This evening two plane spotters posted almost identical Tweets, drawing my attention to something I should be, but frequently forget to, keep an eye on. ADS-B transponders, from planes over the Mediterranean. From this we know from ~1700Z to ~2200Z on September 10th 2017, US Navy Boeing P-8 Poseidon registration #168440 was circling something off the coast of Malta, or working over an area looking for something. Well, strangely I've been speculating there may be a Russians arms shipment going to India on (at least) two civilian ships in the area; the Ocean Fortune (MMSI 636013841) and Ocean Dream (MMSI 636016448). Where were they between 1700Z and 2200Z? 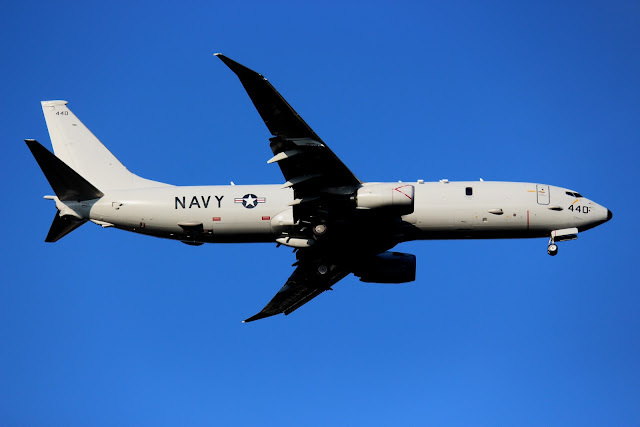 I'm fairly certain the US Navy P-8A is outfitted with night vision capability, possibly using SAR. They may have been waiting for dark in order to inspect the ship at long range, ie without raising suspicion. However, they left their ADS-B transponder on, so they would have been very visible to anyone who was looking for them. Was this an accident? Not usually. The US Navy is usually very aware of their transponders. I used "large" icons for the time period of the P-8A flight, but without the exact coordinates they flew, you just have to eyeball the screenshots and my map above. What do you think? It sure looks to me like the US Navy wanted a closer look at the RoRo and container ship that may be carrying S400s to India. A bona fide "Vessel Of Interest"!